Top off a round of golf with a round of perfectly cool drinks using these golf ball-inspired chillers. Your golf game is never watered down, so why should your whiskey be? Celebrate another successful day on the greens or treat your favorite sports enthusiast with these golf ball-inspired chillers. The set is packaged in a handcrafted, giftable wooden box, and is sure to become a summer (or, let's get real, any season) essential in your bar set-up. Chillers made in China. Wooden box handmade in Minneapolis, Minnesota by Darrell Kramin and his team. Hand wash and place in freezer for four hours before using. Attractive, easy to use and a conversation piece. It's truly a thoughtful and unique gift especially when someone is blessed to have most everything they need. My dad is really hard to buy things for. He loves golf and whiskey so this was fun and perfect for him. Surprisingly durable product that has no seams or funky odors. Comes in nice box with oouch made from good sturdy material. 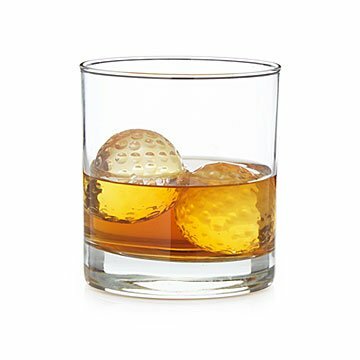 I originally thought this was a whiskey glass with golf balls in it, which would have been a perfect gift. I like the chillers, it is presentable and I hope the recipient enjoys it! My dad loved these. Two of his joys combinged, whiskey and golf. Perfect gift for a glass of whiskey. A fun, stylish gift to give for anyone who golfs and enjoys adult beverages. Came in a nice wooden box.